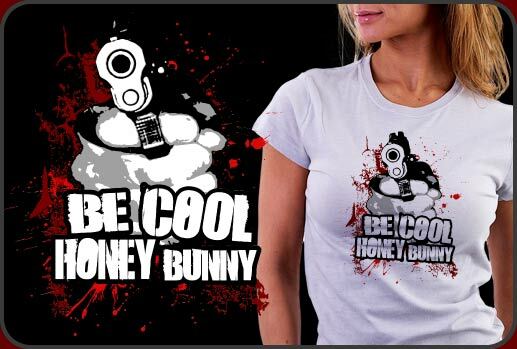 Be Cool Honey Bunny! Our newest Pulp Fiction Shirt is a hot design for fans of the film. Very cool Pulp Fiction Shirt inspired by the final scene of Pulp Fiction, where Jules, having had a life altering revelation about his place in life has a rather stressful sit down with 'Ringo' and Honey Bunny interrupting their brilliant plan of robbing a diner. Our newest Pulp Fiction Shirt is inspired by the one line 'Ringo' nervously utters with Jule's insistence, "Be Cool Honey Bunny"
Our Pulp Fiction Shirt is a great item for any fan of the movie. An original movie art creation by the freaky elves at CuriousInkling.com. Our Pulp Fiction Shirt prints beautifully on any color shirt, light or dark and makes a great gift for the Pulp Fiction fan you love. We have lots of Pulp Fiction shirts to choose from. An amazing assortment of Pulp Fiction shirts, Pulp Fiction sweat shirt, Pulp Fiction tee shirt, Pulp Fiction tanks and so many more shirt styles we don't have room to mention them here! Just click on the button and choose the style, color, location of the design!